Honor your father and your mother – that is the first out of the Ten Commandments that God gave the Israelites through Moses, as listed in the book of Exodus. This verse certain takes a direct reference from Exodus 20:12 – Honor your father and your mother, so that you may live long in the land the Lord your God is giving you. However, I do not want to look at the idea of ‘honoring one’s parents’ in the context of the 10 Commandments – today is the last day of the year according to the lunar calendar, and as a Chinese, it has is a part of the culture that I’ve been born and bred in that on every Lunar New Year’s Day eve, which is today, the family gathers together for a reunion dinner – perhaps much like the Thanksgiving dinner of the West. Lunar New Year is a very big thing over here in the East, many countries that celebrate it have an average of a week off. I only have two days to celebrate it, but it’s still a very big thing, and it’s with the reunion dinner in mind that I look at this verse in particular, on this special occasion. 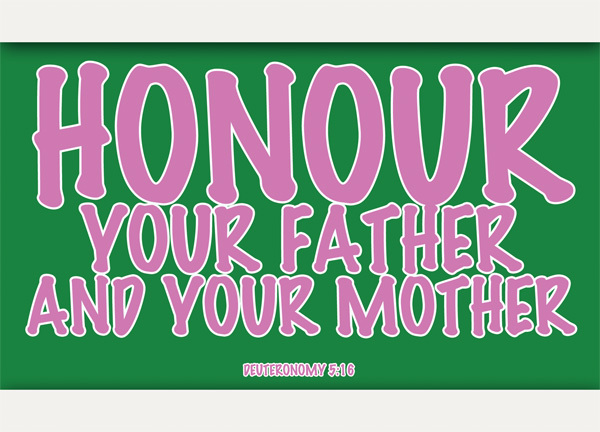 Honor your father and your mother – this is a direct reference to the first of the 10 Commandments given to Moses for the Israelites and first stated in Exodus 20:12; but also referenced in several other instances in the Bible [Matthew 15:4, Matthew 19:19, Mark 7:10, Eph 6:2, amongst others]. I once heard a sermon on marriage (just to clarify, I’m not married) where the pastor said, honor is given, respect is earned. Now curious about this I went back and researched on this statement, and it’s really not anything more than a personal motto – it’s hard to conclude a statement like that from any parts of the Bible, in fact, different scholars and pastors will tell you different things, from respect is earned to respect is given; to honour is earned/given; to trust is earned. Definitions of the term ‘honour’ also vary, depending on the context eg Eph 5:33, 1 Peter 2:17, and depending on translation. We don’t get to choose our parents, that’s obvious enough. And often it may not be easy to honour or respect our parents. I like that this verse states your father and your mother out so blatantly, instead of lumping them together as parents. But whether you subscribe to the honour is given argument or not; I’d like to think that when it comes to our parents, they’ve earned the right to receive our honour and respect when they gave birth to us and brought us up. In simpler terms, I’d like to think that just by being our parents, they deserve honour and respect, even if by human definitions they may not be good parents and even if they may not have been physically or emotionally present in our lives. Honour your father and your mother. There’s no ‘if’ or other condition that comes after the commandments. No matter who they are, no matter where they are, no matter how good they were. Honour them. as the LORD your God has commanded you – this is the main difference between this verse and Exodus 20:12, and basically this phrase serves to highlight that this verse was indeed a replica of Exodus 20:12, where the first of the ten commandments was listed – As part of the 10 Commandments, it was a clearly a command from God to the Israelites – from God to Men. so that you may live long and that it may go well with you in the land the LORD your God is giving you – this is a promise. The first commandment to be annexed with a promise. Other commandments were short and straightforward – eg you shall not murder [Exo 20:13] or you shall not steal [Exo 20:15]; but the first commandment had a promise from God that came together with it, and that fact was also observed and noted by Paul the apostle in Ephesians 6:2 – “Honor your father and mother”—which is the first commandment with a promise— and that it came with a promise from God shows clearly how important it is to God that we honour our parents. I won’t touch too much on the contents of the promise, as it’s very much linked to the context of the Israelites at the point in time when they were given the commandments in the book of Exodus. But that it comes with a promise is something that we shouldn’t belittle, for whenever God promises, it is a matter of consequence, and he will certainly deliver his promises. There are certainly not as many verses on family values or family love as there are about more general values and love, but the verses on the respect of one’s parents amount to quite a number. Obeying our parents pleases the Lord [Col 3:20], and it is right [Eph 6:1]. Do you know what’s a steamboat? I hope you do, because it’s hard to explain it. Basically, it’s a must-have during reunion dinners, and it’s something we Asians eat very regularly as a form of feasting. I had 3 steamboats over the course of the Lunar New Year alone, and it’s really just a good opportunity to gather and feast. I’ve come to understand that as we age, get married and move out, returning to our parents’ home for a reunion is one of the simplest ways to honour our parents – at least in the context of my culture and city. I still live under the same roof as my parents – it’s unlikely that I’ll move out anytime soon, and I am suddenly thankful for the opportunity to still be able to honour my parents firsthand and on a day-to-day basis for now. The application of honoring my father and my mother will probably differ in the years to come, but for now, I’ll learn to do what I can.